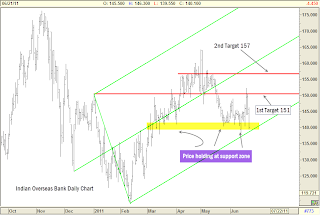 Further to the earlier post http://mappingmarkets.com/2011/06/22/short-term-bounce-in-indian-overseas-bank/, the stock has hit the first target of Rs.151. Investors may take profits. 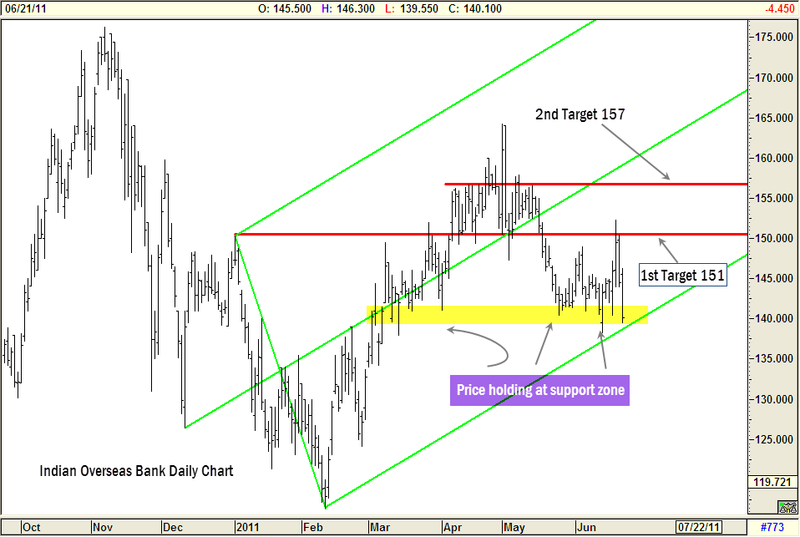 Those who wish to play for the next target of Rs.167, may move stops to breakeven. The stock has corrected a lot and appears set for a short-term bounce. Any downward move during this week would be an opportunity to buy with a stop-loss at Rs.2,100. 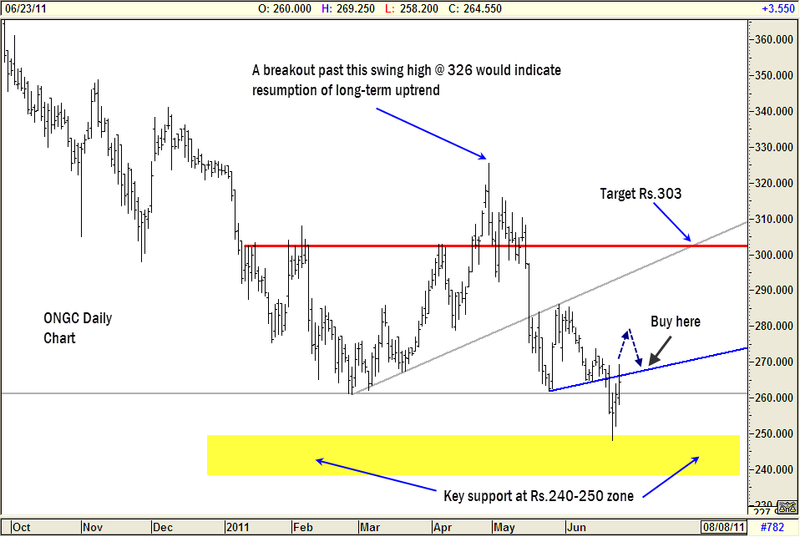 The initial target is at Rs.2,500, followed by major target of Rs.2,685. While there is a case for a minor bounce, there are no signs of reversal of the major downward correction. The stock has to move above the June 24 swing high of Rs.2,960, to indicate reversal of the medium-term downtrend. ONGC: A Relief At Last? Crude oil has cracked big time in international market. The EGOM meeting is scheduled today, which again could have implications for ONGC and other oil marketing companies. Let’s take a look at ONGC, which is one of the index heavyweight and probably a big beneficiary if the government decides to act. 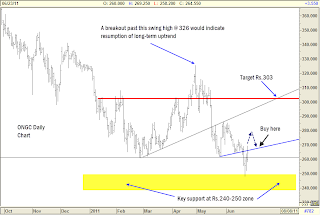 From the daily chart, it is apparent that the buyers are stacked up at the Rs.240-250 range. The “key reversal day” pattern, formed a couple of days ago, right at this crucial support level, is a bullish sign. Let the stock get past minor resistance at Rs.274. 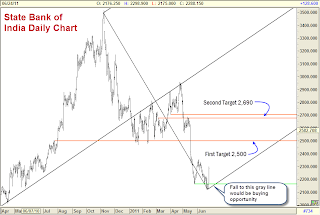 Long positions may be considered on a subsequent fall, for a target of Rs.303. Stop loss for long positions should be placed at Rs.244. While there is a strong possiblity of a rally to Rs.303, I still do not have a very compelling trading plan to participate in this potential upward move. 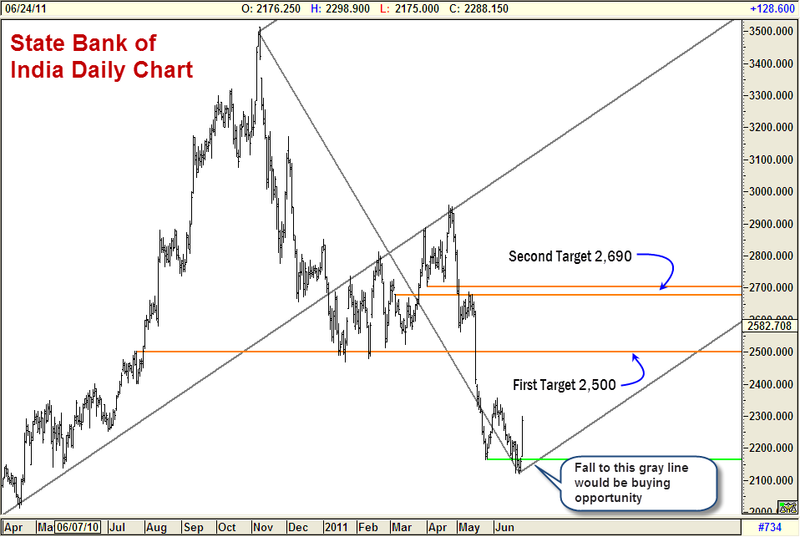 We however need to close above the major swing high at Rs.326, to indicate reversal of the recent downward correction. Indian Overseas Bank has corrected in the recent weeks. It is offering a relatively low-risk buying opportunity for a rally to Rs.151. Long positions may be considered with a stop loss at Rs.134. A breakout past Rs.151 could trigger a rally to the next target at Rs.157. A breakout above Rs.165 would lend momentum to the uptrend and could signal the start of next leg of major uptrend.